Description: Most Canadian bank notes from 1937 feature a portrait of King George VI (with exception of $100 and $1000 bills). Each denomination has a different color tint, just like modern currency does today. One dollar bills are a green color. The first thing you will probably notice is that the left side of each bank note has English text and the right hand side has French text. This was a change from 1935 bank notes, which were printed with either just French or just English text. 1937 $1 bills were printed by The Canadian Bank Note Company, Limited. Varieties: There are 4 different varieties for the 1937 $1 bill from The Bank of Canada. The main three verities are based on the signature combination. Possible deputy governor and governor signors include J.A.C. Osborne and G.F. Towers, D. Gordon and Towers, and J.E. Coyne and Towers. The Gordon Towers variety can be broken down even further based on the size of the portrait. We are showing a “wide portrait” note. If there is more space between the top of the oval portrait and the beginning of the border design than what we are showing, then you have a narrow panel note. Narrow panel notes are definitely rarer. 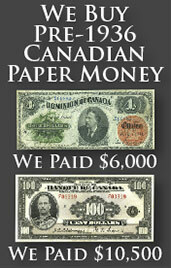 We buy all Canadian $1 bills issued in 1937. Our offers are dependent upon the condition and rarity of your specific bank note. 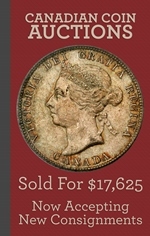 Prices generally range from $5 to $75; especially choice notes or rare varieties could be worth multiples more money. Send us pictures of your paper money and we will respond quickly with our buy and sell price. Don’t be shocked if we can pay a lot more than you were expecting. There is a strong market for 1937 one dollar bills from Canada and we would welcome the chance to work with you if you decide to sell yours.